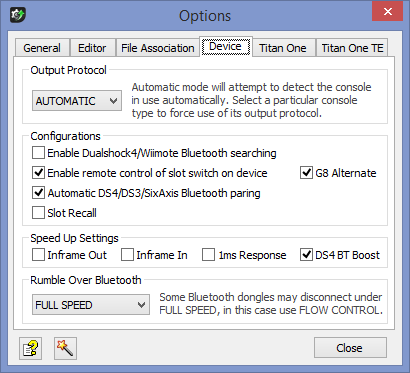 The Options dialog window is used to control settings and preferences of the Gtuner PRO software and of the Titan One device. The Device and Titan One tabs are only functional when the Titan One device is connected to your computer by the PCPROC side port, through a USB cable. • Output Protocol: The Titan One device supports all five console output protocols: PS3, XB360, PS4, XB1 and SWITCH. Use the checkbox to select the correspondent protocol to the console system you are using. The AUTOMATIC option is useful for those who use the device in more than one particular system. If the output protocol setting don't match the console system you have, the device will not work properly. If you want to speed up the DS4/DS3/XB1S/SwitchPro wireless syncing, leave this option disabled. Operate the device slot switch remotely using your controller (Select+PS / Back+XBox / Share+PS / View+XBox). Control the device slot switch remotely using an alternative button combination for G8 consoles (L3+PS / LS+XBox). This option automatic pairs the DS4/DS3/SwitchPro controller with the Titan One. If you want to use the DS4/DS3/SwitchPro controller as wired only, disable this option. The device will remember the last active slot when restarted. Check if there is more data to send to Console within current USB frame. This setting helps improve performance and reduce input lag. Check if there is more data to receive from Controller within current USB frame. This setting helps improve performance and reduce input lag. A response time of one millisecond is the fastest response time possible for USB devices. Disabling this option will make the device run at the original speed of the Console currently in use. This setting sends multiple endpoint requests within a same USB frame. This setting improves the data acquiring from Dualshock 4 controllers over Bluetooth connection. • Rumble Over Bluetooth: Some Bluetooth dongle are not compatible with FULL SPEED rumble over Bluetooth. This feature requires a high band width, usually not supported by old or cheap Bluetooth dongles. The work around is select the option FLOW CONTROL, FLOW CONTROL+ or DISABLED. • Titan One Backlight: The backlight behavior can be configured in one of four states: Mimic Controller Player LED, Strict Controller Player LED, Custom Color or Disabled. The Titan One backlight will mimic the controller's LEDs using the Dualshock 4 color code: Blue for player 1, Red for player 2, Green for player 3 and Magenta for player 4. This option is very useful to get a GamePack LED feedback when using a XBox One controller. The backlight will strictly display the Player LED set by the console, leaving the controller's LEDs free to be used by a GPC Scripts or Gamepack. This mode also uses the Dualshock 4 color code to represent the Player. Check this option to configure a specific backlight color. Turns off the Titan One backlight. • Backlight Custom Color: The backlight color can be customized by choosing one between seven available colors: Blue, Green, Cyan, Red, Magenta, Yellow and White. 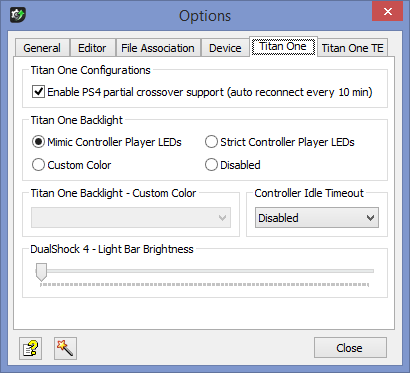 • Controller Idle Timeout: Configure the Titan One to automatically shut down your wireless controller after a certain idle time, useful to save battery. • Dualshock 4 - Light Bar Brightness: Adjusts the brightness of the Dualshock 4 light bar. 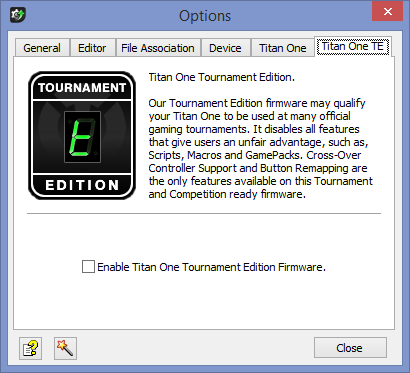 Titan One Tournament Edition Firmware. Our Tournament Edition firmware may qualify your Titan One to be used at many official gaming tournaments. It disables all features that give users an unfair advantage, such as, Scripts, Macros and GamePacks. Cross-Over Controller Support and Button Remapping are the only features available on this Tournament and Competition ready firmware. After enable/disable the Tournament Edition Firmware, the device firmware update is required to complete the operation.